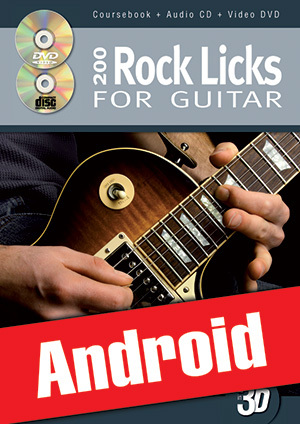 200 Rock Licks for Guitar in 3D (Android) (GUITAR, Courses for Android, Rudy Roberts). With its 200 licks and phrases, conceived by the most famous guitarists, this coursebook is a veritable Rock-cyclopedia imperative for everyone working on Rock. In the matter of style (rock, hard-rock etc. ), playing techniques and difficulty the licks presented here are radically different. Therefore you may rest assured that this coursebook will give you full satisfaction – in terms of both level and preference. To make your learning more enjoyable, each lick comes with a corresponding video recording on the DVD (first at actual, then at a slower playing speed) and one or more applications on the CD. Along with the licks, you are presented the names of the chords they should be played with and the melodic tools that come into use. Therewith you learn to place the licks correctly in order to subsequently use them in different contexts (place in the chord progression, key etc.). By helping you to appropriate the vocabulary and rhetoric of Rock, this coursebook will develop your musical prowess and your improvisational skills.